Eglish camogs will be stepping into the unknown on Sunday as they walk out at Croke Park intent on bringing the All Ireland Intermediate Championship title back to Tyrone (1.30pm). Manager Martin Curry admits he locals know little about their opponents, Myshall of Leinster, who overcame Cappataggle of Connaught by a goal in their semi-final with Eglish defeating Munster’s Gaultier 1-05 to 1-04 in an enthralling game to reach the decider . 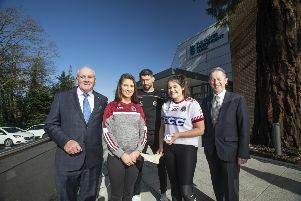 The personnel of the Eglish team has changed little over the last few years and can boast two consecutive Ulster Intermediate Championships to their name. The recent success is a welcomed return to the heady days of the early 1990s when the club won three Ulster titles in a row and progressed to 1991 All Ireland final in 1991 with two players from that team still on the current squad. Brenda Horsfield and Leona Gallagher remember well their last All Ireland final and both players remain the backbone of the current back line. Goalkeeper Gallagher has fond memories of the time since that last final in 1991. Brenda and I both played in the 1991 final,” smiles Leona when quizzed on her team-mates. Current Eglish captain, Ciara McGready, is excited about the prospect of playing on the famous turf on Sunday. “It is a great honour for me to captain the team and getting to the final means everything,” she explained. “It shows how hard we have worked all year to get to this point, the commitment and determination shown by everyone has been outstanding. Manager Martin Curry has steered the team, along with his sons Nathan and Odhran, to a very fruitful period with this current Eglish side but he says the success is down to the hard work of the players. “It is a privilege to be involved with this group of players heading into an All Ireland final. They have worked extremely hard to get to this stage and made a lot of personal sacrifices. The club also paid tribute to all the supporters and everyone who has so kindly helped the club along the road on the magical journey to Croke Park. Current squad: Leona Gallagher, Laura Mason, Julie Lagan, Cathy Jordan, Aisling Donnelly, Brenda Horsfield, Claire Jordan, Shauna Jordan, Ciara McGready (Captain), Ciara Donnelly, Maria Haughey, Niamh McNulty, Aisling Jordan, Meabh McHugh, Leanne Donnelly, Lisa-Marie Skeffington, Amy Barrett, Annette Jordan, Kelley Cuddy, Denise Galvin, Siobhan Hughes, Meabh McGleenan, Casey Gallagher.